Upper School Director of Music Daniel Singer was named Assistant Director of Choruses for the Cleveland Orchestra and Director of the Cleveland Orchestra Youth Chorus at the start of the 2018-19 season. Mr. Singer recently began his seventh season with the Cleveland Orchestra and his eighth year of teaching at University School. Mr. Singer has sung professionally with Quire Cleveland and Apollo's Fire, and he has performed locally as a soloist with the Wooster Symphony Orchestra and the Suburban Symphony Orchestra. 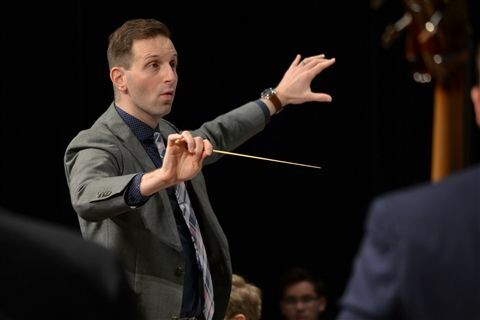 In addition, Mr. Singer has served as Director of the Contemporary Youth Orchestra Chorus and as Associate Director of Choral Arts Cleveland, and he is regularly engaged as a guest conductor, clinician, composer, and arranger by ensembles across the country. "The only thing I knew about Cleveland before moving here was that this city has one of the finest orchestras in the world," Mr. Singer said. "When I started getting into classical music in high school, some of the first recordings I bought featured the Cleveland Orchestra and the Cleveland Orchestra Chorus, and when I arrived at University School in 2011, (Associate Headmaster) Bill O'Neil gave me the Orchestra's 75th Anniversary CD set, which I immediately made my way through and still listen to often. "The Cleveland Orchestra has long been one of this city's greatest ambassadors, and I'm thrilled that I get to contribute to the musical life in Northeast Ohio by assuming my new roles within the organization. I am especially honored that the Cleveland Orchestra has entrusted me with the training of the exceptional young musicians of the Youth Chorus, and I'm excited for all we will accomplish together this season and for years to come. I am grateful to (Head of School) Patrick Gallagher, (Director of the Upper School) William Daughtrey, and the entire US community for supporting me as I take on these new responsibilities." The Cleveland Orchestra Chorus is one of the few professionally trained, all-volunteer choruses sponsored by a major American orchestra. In addition to performing with The Cleveland Orchestra in concerts at Severance Hall each season, the 150-member Chorus has appeared with the Orchestra on tour in Boston, Brussels, Edinburgh, Frankfurt, London, Lucerne, Luxembourg, Miami, Paris, and New York, as well as on television and in numerous recordings. The Cleveland Orchestra Youth Chorus was founded in 1991 to raise awareness of choral music-making in the schools of northeastern Ohio and to encourage more students to continue their choral activities through college and into adulthood. The Youth Chorus comprises approximately 100 members in grades 9 to 12 and representing 40 schools and communities. Members are chosen through competitive auditions. The Youth Chorus presents an average of five concerts each season and collaborates with other musical ensembles such as The Cleveland Orchestra, the Cleveland Orchestra Youth Orchestra, and Cleveland State University and Baldwin Wallace University Conservatory of Music choral ensembles. Upper School Director of Music Daniel Singer leads the Upper School Orchestra. Mr. Singer also directs the Glee Club, University Singers, and the US Males.